How it all started: a dream to travel the world! A wave of contentment spread over Lewis the Lion as he left Palolem in the taxi. What a truly spectacular adventure he had on his worldwide journey but now it had seemed to have come to an end all too soon. He could barely believe that it was a year ago tomorrow when he first set off on this extraordinary journey. 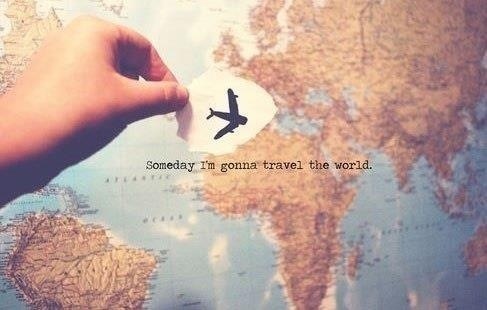 And who could have ever imagined what fun, challenges and opportunities his adventure would had thrown up? Certainly, Lewis the Lion felt like he had lived out all of his dreams and then some! Never in his wildest imagination could he have predicted some of the amazing opportunities that had arisen nor did he think he would have been able to have achieved some of the things he had done, such as skydiving, trekking in the Amazon and scuba diving off the Great Barrier Reef. Neither did he ever anticipate some of the special friends he would make along the way. Helen’s Facebook friends list for them both seemed to have grown exponentially! He reflected that it was amazing what could happen to you in life if you but dared to dream a little, as he had done. Do you remember how he had started off with his big dream? It was incredible what doors could be opened for you if you but faced your fears and gave things a try. He realised in that moment that life was all about the choices we make and that with a little bit of hard work and dedication, we could all achieve the impossible. 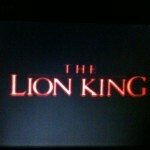 Who had ever heard of a travelling lion after all? ‘The world truly is our oyster and it’s here for every single person on this planet to cherish and enjoy,’ he contemplated. Lewis now opened the taxi window and could feel the warm breeze drift through his mane as he looked out onto palm trees and fields. Happy children in smart blue uniforms passed by in groups. It was a Friday afternoon and no doubt they were grateful to have finished school for the weekend. He chuckled to himself as he passed a line of cows and then water buffaloes wandering leisurely by the roadside. He wondered when in his life he was next likely to see that? He could only begin to imagine the pandemonium should a cow be walking by a busy road back in the UK! Somehow he wondered if it might even feel boring driving around in the UK after his Indian experience? (If you haven’t already, check out Lewis the Lion’s blog on ‘India’s street life gets under Lewis the Lion’s skin!’). Before he left India, Dushyant’s words rang in his head, ‘Expect the unexpected.’ It wasn’t the organised chaos at Mumbai airport that surprised him, nor the incessant beep -beep of the traffic outside the airport (he was well used to that by now) but rather the shower situation in the hotel. After waiting for ages for the hot water to warm up, he thought he’d try the cold tap instead. Low and behold hot water gushed out. India truly was always full of surprises even up to the last minute! It now felt strange to be boarding his penultimate flight home. An almost ten hour flight back to London, followed by a three hour wait at Heathrow’s Terminal 5 before flying up to his home town, Newcastle upon Tyne. He wondered what the first thing he might do when he got back to England? Apart for being grateful for getting home safely, perhaps he’d slot back into the regular routine of checking the Saturday football scores and then going for a cup of tea somewhere in the airport? For now, he sat back and enjoyed the flight on this enormous airbus from Mumbai to London. 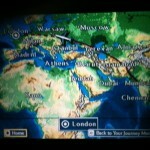 Aboard the Airbus – the Boeing 747, one of the biggest planes that Lewis has ever been on! 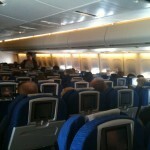 Each row has 10 seats and the flight even has a top deck! 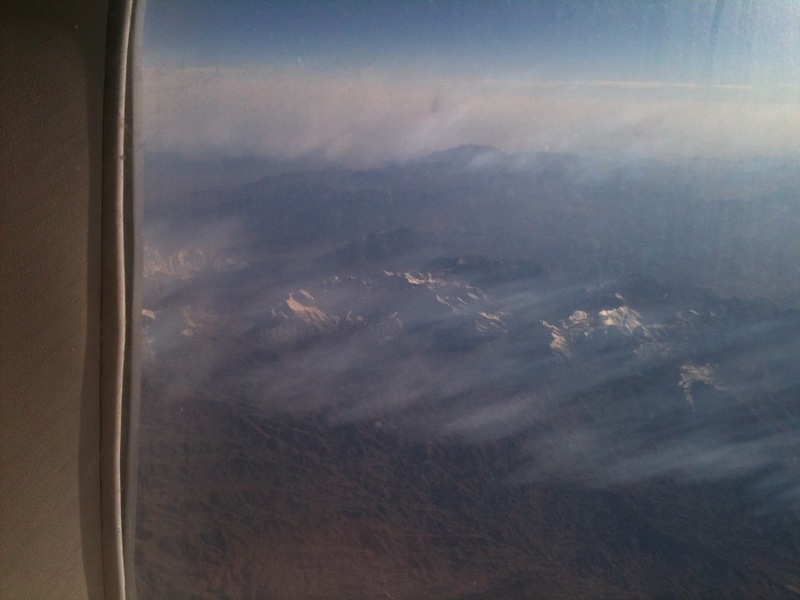 He loved flying high over the mountain range between the Pakistani and the Indian border. The more he travelled, the more he realised that there was still so much to see of the world: Pakistan was one destination that he definitely wanted to get to at some stage in the future! 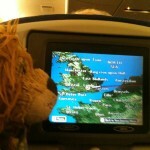 He enjoyed watching the monitor which showed where the flight was on its journey. He was excited at the prospect of going home. He just couldn’t wait to see everyone again! It seemed only fitting that he should conclude his whole adventure by watching that of another famous lion – Simba – in the Lion King! 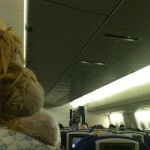 So he rested his little paws behind his head and enjoyed the film before arriving back on home territory in England. 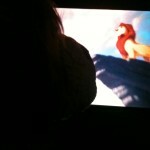 Lewis the Lion gets to watch the Lion King on his journey home! How do you think you would feel returning home after such an epic adventure? What film do you think you would choose to watch on the flight on the way home? This entry was posted in Lewis' Blog and tagged children's travel blog, dream, educational travel blog for children, flights, for kids, Lewis the Lion, London Heathrow, Mumbai, round-the-world, RTW, the Lion King, travel, travel blog, travel blog to inspire kids, travel stories to inspire children, travel writing for children. Bookmark the permalink. Your writing is prolific….we are trying hard to keep up! Thank you for all your wonderful stories!! Thank you! 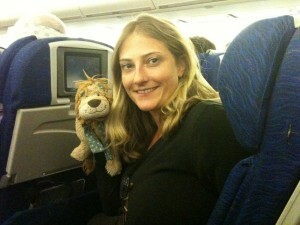 I’m doing my best to finish the stories off from Lewis the Lion’s epic worldwide adventure. A few more to conclude and then there will be a few with AJ in them!